Originally published on VerySmartBrothas and The Root. I have an older cousin named Halima. She lives in Nimes with her husband and five-year-old daughter, named Hikma, who is an avid Frozen enthusiast (called La Reines des Neiges in French) and Beyonce-in-training. For the most part, they live relatively peaceful middle-class existences. But every morning, Halima makes the trek from Nimes to Avignon to go work at the hospital there — and every morning, she quietly recites the basmala to herself. Bismillahirrahmanirrahim – “In the name of God, the Most Gracious, the Most Merciful.” Those few words help her muster up the strength to get on the train and face her sincere fear that her next day on public transportation could be her last. It should be no surprise that anti-Blackness is a phenomenon that extends to Western Europe, considering that they were the initial settlers of what is now America and the Transatlantic Slave Trade. However, the concept that countries like France are these magical, post-racial havens for the truly evolved and erudite has been a concept that seems to have persisted from the Baldwin era. Visions of smokey rooms where elites hobnob with Black American intellectuals over cognac and transcendent jazz music continue to be the predominant perspective, drawn out from the near-reverent recounting of Black American academics and artistic contemporaries from the Harlem Renaissance and post WWI-era. While that may be a seemingly innocuous statement, it obscures a few key things. Most glaringly, there’s an implication that France did not participate in chattel slavery, which it did, as did most Western European empires at the time. 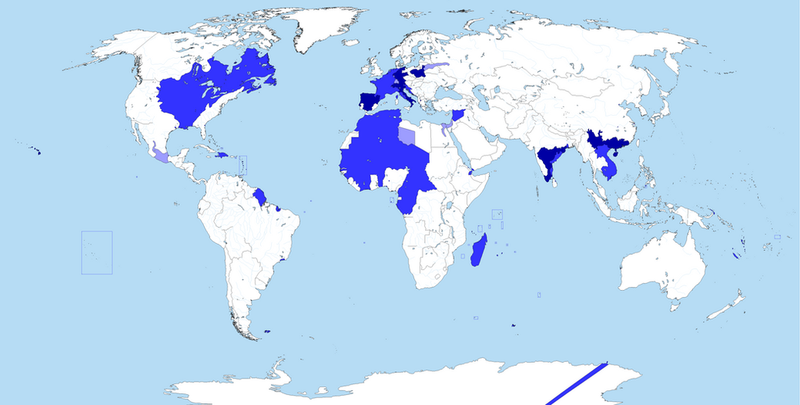 Secondly, while it is true that the French colonial empire extended to parts of Southeast Asia, any map of the modern French colonial empire will make it plainly clear that their rule extended primarily over Black nations — and that autonomy over Black states extended well into the the 20th century. The country where my family is from, Comoros, didn’t obtain independence until 1975; which is to say, my mother was born under French rule, with a French passport, and a French birth certificate. What is arguably most glaring is this attempted bifurcation of race and religion — identities, which in France, are almost inextricably linked. Yes, France has a strong case of Islamophobia, which is made quite evident by things such as the “secular” law banning women from wearing religious headdresses in public, as well as the recently passed law enabling French government to revoke the birthright citizenship of anyone convicted of “terroristic” activity — terroristic activity being this amoebic catchall that is yet to be defined, of course. That said, the key oversight in that assessment is that of the millions of French citizens and residents that self-identify as Muslim, approximately 80% of them at last count were 1st or 2nd generation descendants of the African continent. Subsequently, it is these people who are consistently harassed; pulled off trains and demanded to show their papers, pushed into slum communities (also known as banlieues), denied jobs they are qualified for, quality education or service without cause, arrested with limited justification, belittled via “satirical” comics. And yes, even murdered, as we are in the United States. On July 19th, Adama Traore, a Black Muslim Frenchman, died on his 24th birthday in police custody. As I write this, the family still doesn’t have any concrete answers as to what happened during his transport. This is a tragedy that we are all too familiar with here in the US, but it is a pain that reverberates globally; the extinguishing of Black bodies with little disregard or concern for the communities that continue to sear with the remnants of that anguish. It is for those reasons that my cousin prays. She prays to get home in one piece. She prays to not run into law enforcement. She prays for her daughter to not have to recall her in memories before she should have to. This isn’t the part of France you will see on TV. It might not even be the part of France you see in person; the banlieues exist on the outskirts for a reason, and if you just stay in the 20 arrondissements of Paris with your American passport in full view you may just consistently be viewed as a tourist first. I would certainly assume that a writer of Coates’s stature would be of the means to stay close to the city center, nor do I deride him for that choice. That experience, however, doesn’t dismiss the suffering of large swaths of Black communities just a few miles south. Black neighborhoods are being torn apart by fraught relationships with both police and non-POC demographics, and they are crying for their voices to be heard. We should take pains to not erase that context in framing our own personal experiences. Baldwin once said of America, “all you are ever told in this country about being Black is that it is a terrible, terrible thing to be.” That sober reality unfortunately still hold us tight in our clutches in 2016; not just in the United States, but in large swaths of the Western World. Anti-Blackness is everywhere, even in the home of the Age of Enlightenment; and it would behoove us to step away from viewing White supremacy as a uniquely American problem as much as it is a pervasive viciousness that has left its imprints on Black populations the world over.